After featuring Carlos Ezquerra’s early Battle (and one Action) covers previously in this series, I always intended to return to the magnificent Zaragozan in order to post some of his 2000AD (and one Starlord) covers. 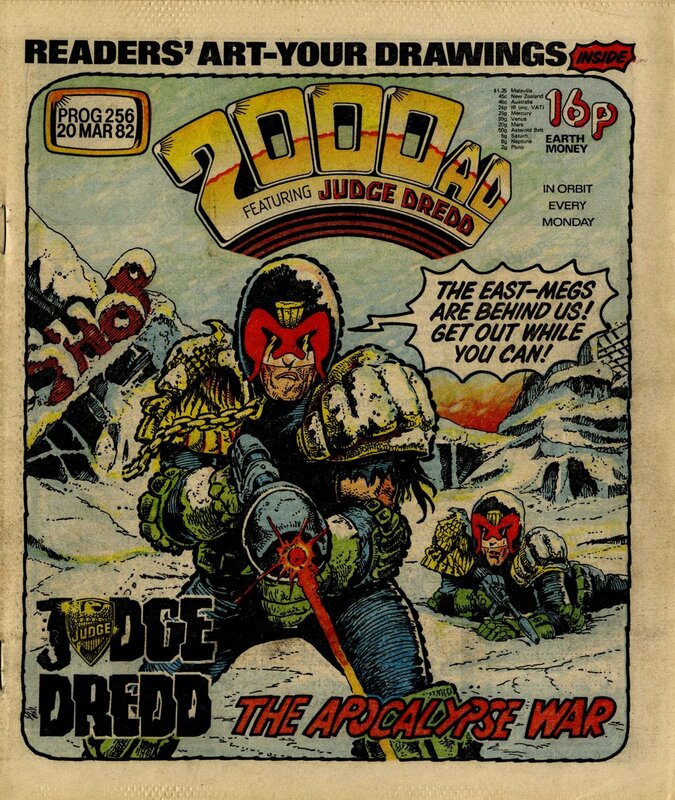 For me, Carlos – artistic creator of Judge Dredd, Mega-city One and Strontium Dog Johnny Alpha – is the artist I associate most closely with the image of 2000AD. As wonderfully and deliberately diverse the artwork of the Galaxy’s Greatest Comic is (and not to minimise the significance of such formative, iconic artists as Kevin O’Neill, Dave Gibbons, Mike McMahon, Brian Bolland, Massimo Belardinelli, Ian Gibson, and others), it was Carlos’ work that fascinated and captured my imagination as a young reader in the very early 1980s. I loved the boldness of his lines, that unique set of curves that he brings to virtually every design, the grittiness, the wackiness, the humour, and the heavyweight futuristic hardware. 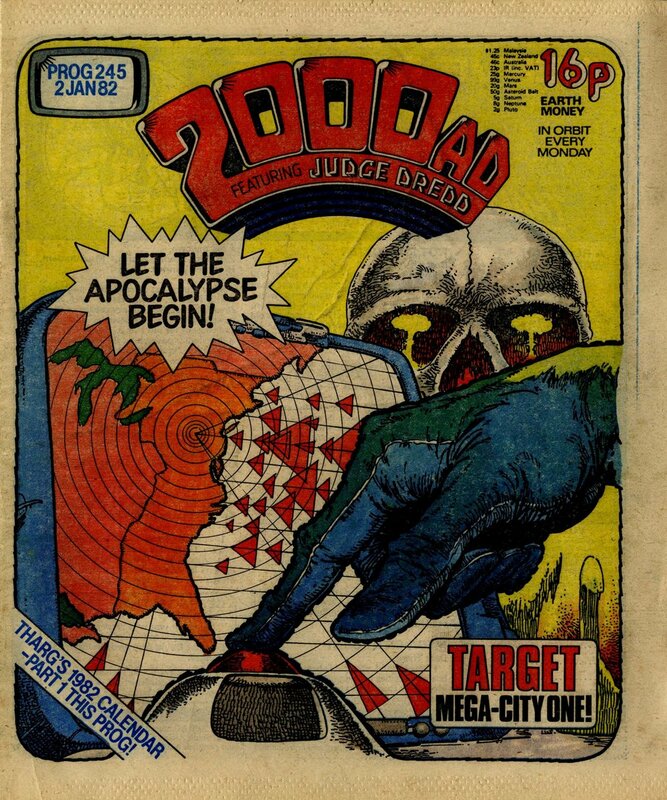 That Prog 179 cover was one of the earliest that I owned, and I can clearly recall being inspired to start drawing my own series of sci-fi comics, each of which boasted a circle-based cover image. Gracias, Señor. And Gracias also to everyone who has read, liked, shared and commented on the 31 posts in this Classic Cover Artists series during the month of August. It’s been a lot of fun to put together, and seems to have gone down well judging by the reactions on Twitter and Facebook. I’m happy with the choice of 29 artists (Carlos and Ian Kennedy each featured twice) on the basis of balance, although there were a number of other artists whose outstanding cover designs for IPC in the 1970s and 1980s could have seen them included. Brett Ewins, Robert Nixon, Sid Burgon, Robert McGillivray, Robin Smith, Eduardo Feito, Honiera Rumeu, Jesus Redondo, John Armstrong, Jimmy Hansen, Jim Watson, Mike White, Steve Yeowell, and others all come to mind. Perhaps I’ll add more to the series as an occasional feature in the future. In the meantime, I’ve just realised that today marks the second birthday of the blog, so Happy Birthday to All Readers!